when i open my file i can do nothing, i only have the normal Windows mousepointer no brush and i can not pick a layer with the H key. i use version 4.8.20 (dx64) steam version . i try the opengl version and the non steam version too. i try version 4.8.25 with the same problem. when i presss the left mouse button over my mesh the ("pick point" see the picture") i think it´s always on 0.0.0 position. 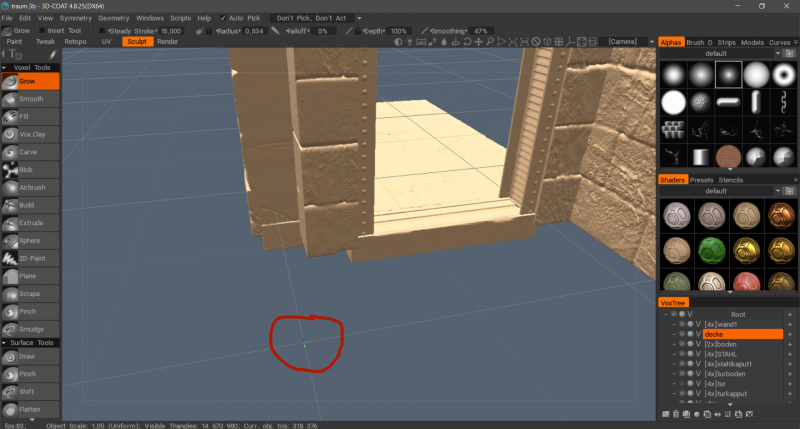 only if i use the cut off tool ,cut a hole in the mesh and undo, then i see my brush and all is working normal. Let me check this issue. Sorry i cant replicate this issue, but some users report issue with fbx files import process. Are you importing fbx or obj ? Please open a new fresh and empty scene, load the model and press shift+a (frame). Do you see any model ? May be the scale is huge ? Geometry > Edit Scene Scale. Are values correct ? i reinstalled Windows ,have newest driver´s. i set it to x0, y0, z0, Scenecale 1,save to new file but the Problem is still there. i attached the file, Maybe something is wrong with my pc. Meantime please export the file as fbx2014.